HNN4497: 7.5 volt 2200mAh Li-ION battery for Motorola CP100 PR400 etc. Home > Commercial-Land Mobile-Marine > HNN4497: 7.5volt 2200mAh Li-ION battery for Motorola CP100, PR400 etc. The HNN4497 is a 7.5 volt 2200mAh Long-life rechargeable Li-ION battery for Motorola CP100, CP150, CP200, EP450, PR400 radios etc. Replaces original battery part #s NNTN4497, NNTN4970, NTN4497, NTN4970, etc. Re-charges with OEM or aftermarket approved Li-ION chargers such as the EMS-4497. CBE-4851 : Battery Eliminator for Motorola CP150, CP200, PR400, EP-450, etc. 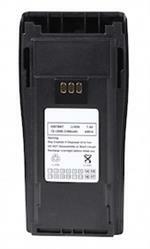 The CBE-4851 is a Battery Eliminator for Motorola radios such as CP150, CP200, PR400, EP-450. One end plugs into 12-13.8VDC socket; other end clips onto radio, for instant mobile power. EMS-4497 : Desktop Rapid-Smart Charger for Li-ION HNN4497, NNTN4497 batteries etc. The EMS-4497 is a Desktop Rapid-Smart Charger for 7.4 volt Li-ION batteries such as HNN4497, NNTN4497 batteries etc. Fully automatic; terminates charging when battery is full. Includes worldwide AC-DC plug-in-wall power supply. HNN4851 : 7.5 volt 1650mAh rechargeable NiMH battery for Motorola CP100, CP150, CP200, EP450, PR400 radios etc. HNN4851 : 7.5 volt 1650mAh long-life rechargeable Ni-MH battery for Motorola CP100, CP150, CP200, EP450, PR400 radios. Replaces original part #s NNTN4496, NTN4496, NNTN4851, NTN4851, NTN4496, NTN4970, etc.